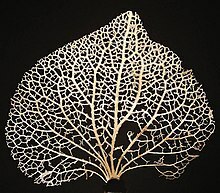 ^ “Molecular evidence for the early colonization of land by fungi and plants”. Science 293 (5532): 1129–33. (August 2001). doi:10.1126/science.1061457. PMID 11498589. http://www.sciencemag.org/cgi/pmidlookup?view=long&pmid=11498589. ^ Knauth, L. Paul; Kennedy, Martin J. (2009). 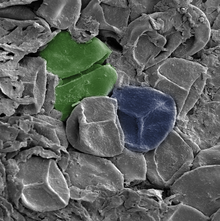 “The late Precambrian greening of the Earth”. Nature. doi:10.1038/nature08213. ISSN 0028-0836. ^ Wellman, C. H.; Gray, J. (2000). “The microfossil record of early land plants”. Philosophical Transactions of the Royal Society B: Biological Sciences 355 (1398): 717–732. doi:10.1098/rstb.2000.0612. ISSN 0962-8436. ^ Rubinstein, C. V.; Gerrienne, P.; de la Puente, G. S.; Astini, R. A.; Steemans, P. (2010). “Early Middle Ordovician evidence for land plants in Argentina (eastern Gondwana)”. New Phytologist 188 (2): 365–369. doi:10.1111/j.1469-8137.2010.03433.x. ISSN 0028646X. ^ Wellman, Charles H.; Osterloff, Peter L.; Mohiuddin, Uzma (2003). 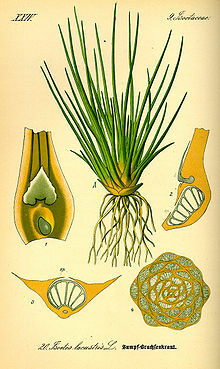 “Fragments of the earliest land plants”. Nature 425 (6955): 282–285. doi:10.1038/nature01884. ISSN 0028-0836. ^ Kump, Lee R.; Pavlov, Alexander; Arthur, Michael A. (2005). “Massive release of hydrogen sulfide to the surface ocean and atmosphere during intervals of oceanic anoxia”. Geology 33 (5): 397. doi:10.1130/G21295.1. ISSN 0091-7613. ^ Butterfield, N. J. (2009). “Oxygen, animals and oceanic ventilation: an alternative view”. Geobiology 7 (1): 1–7. doi:10.1111/j.1472-4669.2009.00188.x. ISSN 14724677. ^ Steemans, P.; Herisse, A. L.; Melvin, J.; Miller, M. A.; Paris, F.; Verniers, J.; Wellman, C. H. (2009). 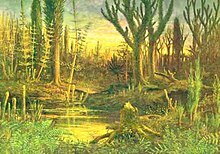 “Origin and Radiation of the Earliest Vascular Land Plants”. Science 324 (5925): 353–353. doi:10.1126/science.1169659. ISSN 0036-8075. ^ Tomescu, A. M. F. (2006). “Wetlands before tracheophytes: Thalloid terrestrial communities of the Early Silurian Passage Creek biota (Virginia)”. Wetlands Through Time. doi:10.1130/2006.2399(02). ISBN 9780813723990. http://www.humboldt.edu/biosci/docs/faculty/TomescuRothwell2006.pdf 2014年5月28日閲覧。. ^ Scott, A. C.; Glasspool, I. J. (2006). “The diversification of Paleozoic fire systems and fluctuations in atmospheric oxygen concentration”. Proceedings of the National Academy of Sciences 103 (29): 10861–10865. doi:10.1073/pnas.0604090103. ISSN 0027-8424. ^ a b c d e f g h i j k l m n o p q r s t u v w x y z aa ab ac ad ae af ag ah . doi:10.2307/3691719. ^ a b c d e f g h . JSTOR 2408738. 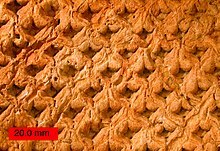 ^ “Evidence for lignin-like constituents in early silurian (llandoverian) plant fossils”. Science 209 (4454): 396–7. (July 1980). doi:10.1126/science.209.4454.396. PMID 17747811. http://www.sciencemag.org/cgi/pmidlookup?view=long&pmid=17747811. ^ Davis, P; Kenrick, P. (2004), Fossil Plants, Smithsonian Books, Washington D.C.
^ Simon, Luc; Bousquet, Jean; Lévesque, Roger C.; Lalonde, Maurice (1993). “Origin and diversification of endomycorrhizal fungi and coincidence with vascular land plants”. Nature 363 (6424): 67–69. doi:10.1038/363067a0. ISSN 0028-0836. ^ Remy, W.; Taylor, T. N.; Hass, H.; Kerp, H. (1994). “Four hundred-million-year-old vesicular arbuscular mycorrhizae.”. Proceedings of the National Academy of Sciences 91 (25): 11841–11843. doi:10.1073/pnas.91.25.11841. ISSN 0027-8424. ^ Brundrett, Mark C. (2002). “Coevolution of roots and mycorrhizas of land plants”. New Phytologist 154 (2): 275–304. doi:10.1046/j.1469-8137.2002.00397.x. ISSN 0028-646X. ^ a b . JSTOR 3515337.